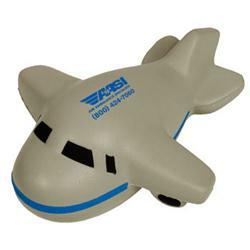 Jumbo airplane stress relievers with your custom logo. These stress relievers are popular for the aviation and travel industries - need a marketing promotion where the sky is the limit. Just call 888-332-ADCO and we will offer more custom jet and private plane promotional ideas. Available Colors: Gray with blue trim. Custom available 3000 piece min. Production Times Available: 8 working days. Available Imprint Options: Top of Plane. Bulk/250 pcs = 36 lbs.